On Mon. Mar 4, the index touched an intra-day high of 2817, but formed a ‘reversal day’ bar by closing below the resistance zone (between 2800 and 2825). That was just the excuse bears needed to swing into action. The index corrected during the rest of the week, falling below its 20 day EMA but receiving support from its 50 day and 200 day EMAs. The ‘golden cross’ of the 50 day EMA above the 200 day EMA has not been a convincing one. The index lost 2.2% on a weekly closing basis. Daily technical indicators are looking bearish after correcting overbought conditions. MACD is falling below its signal line in bullish zone. RSI is seeking support from its 50% level. Slow stochastic has fallen sharply below its 50% level. Signs of a global economic slowdown – if not a recession – and a not-so-great jobs report have taken the wind out of bullish sails. A possible fall below the 200 day EMA can lead to more correction. On longer term weekly chart (not shown), the index closed above its three weekly EMAs in a long-term bull market for the sixth week in a row, but has formed a large ‘reversal’ bar (higher high, lower close) that can trigger a correction. Weekly MACD is in neutral zone. RSI has formed a small ’rounding top’ reversal pattern and dropped towards its 50% level. Slow stochastic has started to correct inside its overbought zone. 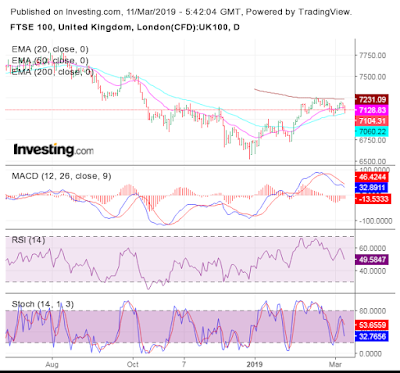 The daily bar chart pattern of FTSE 100 rose to touch an intra-day high of 7212 on Wed. Mar 6, but fell short of testing resistance from its 200 day EMA. The index dropped to seek support from its rising 50 day EMA, and closed just above 7100 – losing only 2 points for the week. Daily technical indicators are looking bearish. MACD is falling below its signal line in bullish zone. RSI has again dropped to seek support from its 50% level. Stochastic is falling towards its oversold zone. The unresolved BrExit deal continues to affect bullish sentiments. The index can consolidate or correct some more. On longer term weekly chart (not shown), the index received support from its 20 week EMA but faced resistance from its 50 week EMA, and closed above its 200 week EMA in long-term bull territory. Weekly technical indicators are giving conflicting signals. 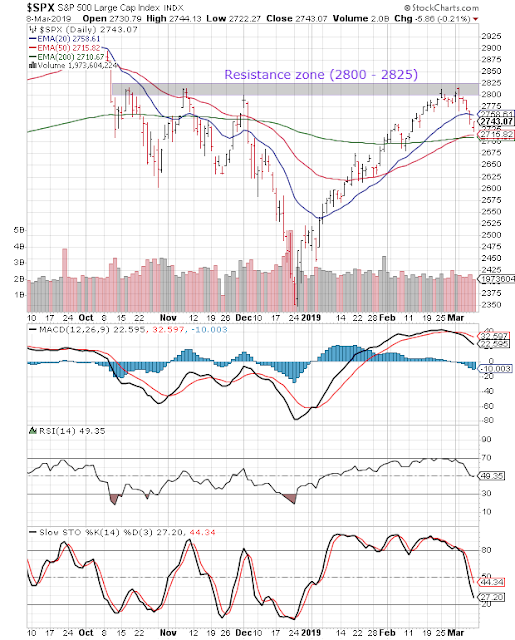 MACD is rising above its signal line in bearish zone. RSI is seeking support from its 50% level. Stochastic has slipped down from its overbought zone.